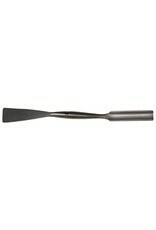 This specialty tool has a flexible flat spatula with rounded edges on one side and a rigid gouge on the other. A great tool for both wax and plaster. Perfectly balanced in stainless steel.